Life gets hectic, and there are times when it becomes downright overwhelming. This is particularly true for adult women, who too often feel the pressure to be superwoman. Unfortunately, it is these same women who make up a significant portion of the migraineur demographic, and it is these overwhelming times that are most likely to push us into an escalating series of migraine attacks. One way to help combat this cycle is to stay in tune with our bodies. What does that mean, exactly? What does it look like? Being in tune with our bodies is largely about self-trust. Trusting our body to tell us what it needs, and trusting ourselves to hear those messages, understand them, and respond to them. Our bodies will always do their jobs. They will send those messages. That’s what bodies do. It is up to our minds to do the rest. Cultivating the body awareness needed to respond appropriately to our bodies takes time and attention, but it is something we can all do using a variety of methods, exercises, and intuitions. One great exercise for beginners involves a kind of mindful meditation known as a body scan. For the body scan, position yourself flat on your back, either on the floor, your bed, or a mat – whatever feels best and most natural to you. Then, gently close your eyes and breathe. Once you are present in the moment, move your attention to your feet, noticing any sensations in the toes, the heels, the soles, the ankles, and the tops of your feet. Invite curiosity to the practice, as if you are paying attention to these sensations for the first time. Once you are sure you have experienced each sensation in your feet, move your attentions slowly up to your calves, attending to each part and sensation in the same manner. From there, move to your thighs, then your hips, then your torso, then your arms, and finally your neck and head. This exercise can take anywhere from three minutes to half-an-hour, depending on your personal preferences. When you are finished scanning, remain still and return to your breath. Finally, open your eyes, and slowly bring yourself to a sitting position. Be mindful of any aches and pains that crop up and try to ease them with self-message or gentle stretching. Watch your posture, and realign when you start to slump or hurt. Pay attention to your energy levels, especially peaks and slumps, to see if you can uncover a daily cycle to work within (also ask yourself what foods or activities, if anything, may be contributing to that cycle). Go to bed when you are tired and eat when you are hungry, without regard for the clock. Deep body awareness takes time, but tuning in at any level will dramatically improve the connection between mind and body, which will help prevent small problems from becoming large ones. This will also help you receive your body’s subtle clues that a migraine attack is coming on, hopefully well before any of the overt signals make themselves known. And advance notice always makes prevention and treatment easier – especially in the midst of hectic times. 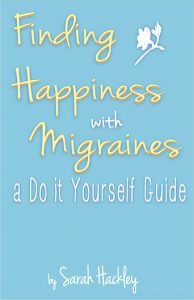 For additional self-care tips on how to live well – and joyfully – with migraine, please check out Finding Happiness with Migraines: A Do It Yourself Guide by Absolute Love Publishing.